“Stunning graphics, great gameplay, overall a freakishly awesome effort. I’m blown away.” –Christer KaitilaI made Hollow for Ludum Dare #21, which is a 48-hour game development competition held online in which you must make all content (sound effects, music, graphics, and non-library programming) during the 48-hour period. This was a really awesome experience; I’ve meant to get into one for a long time, as they’ve always sounded like a lot of fun, but the scheduling (it’s always on a weekend) really made it difficult. This time, however, the stars aligned and I got to work on the game almost every waking hour throughout the weekend, and I’m extremely happy with the result. 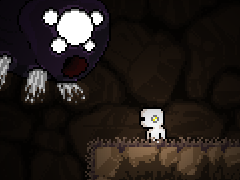 Hollow is an atmospheric, creepy little platformer where you play as a white creature who has fallen down a pit into a cave where he has to fend off multiple multi-eyed, pupil-less monsters to try and escape. This fit the theme of “escape” as much as I could think of, but the development was much more about the game itself than the competition. I haven’t gotten this excited about a game in a while, and even if the game doesn’t do well in the competition, it’s all worth it simply because I finished a game that I truly enjoyed making! Anyways, in the future look out for a more complete version with more levels and content, as I’m hoping to get a sponsor for this game. Thanks for reading! Hey I’ve been playing this and other games aroung your site and I just gotta say, wow. Nice work. I especially like Casus, Sling Drawing, and Cloth. Very awesome, keep up the good work!